The first mark made on a new piece of canvas or wood is always a mark that carries infinite possibilities. Making a mark is an action that can be ambivalent, presenting the mark-maker (‘The painter’ as we now like to call him or her) with both the excitement of a possible new creation and the fear of failing to achieve the power of emotional and visual effect intended. The psychological dynamic behind the mark-making also offers numerous possibilities as to the manner in which to proceed. The painter may come to the canvas or the wood with an image already in mind, or she may choose to let one mark follow another in a process of discovery that will produce something so new (at least in the mind and history of the artist) that it can truly be said that the artist is an instrument of various forces which are not immediately easy to name or describe. This last – the process method – carries with it the danger of frustration and failure to such an extent that many artists prefer to paint ‘what they know’ or what is familiar to them; hence, the popularity of the representational art to both the artist and the viewing public. Margaret Fane, who has been painting for a good many years, moves between the familiar and the unfamiliar, between the representational and the abstract. In both styles, she has the courage to innovate with both materials and the application of paint – between traditional representation and heavy sculptural effect, always looking for that most elusive thing – a style that does not degenerate into a recognisable cliche. Her work is always changing and risks are always being taken. Her most notable feature is her colouring. She is most definitely a colourist over and above everything else, and her grasp of the relation of colours to each other is both intuitive and visually well grounded. It is an artistic instinct that drives her to search again and again for a visual language that assists us, her viewers, in sharing her delight in life and in the sights she sees around her in Western Australia. Margaret was born in 1950 and educated at Stella Maris College in Geraldton Western Australia. She has been trained as an artist at Stella Maris College, Geraldton: Leaving Certificate 1965, the Franciscan Monastery in Rome 2000-, Perth Technical College 2002, Claremont School of Art 2004 – 2006 and the Fremantle Art Centre 2011-2014. Margaret holds a Bachelor of Arts Degree majoring in Fine Art from Curtin University 2014-2017. 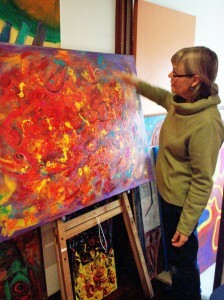 She is a member of the Alfred Cove Art Society, Atwell Art Society and Friends of Ellis House Art Centre. Margaret has had many successful solo and group exhibitions in Perth and her paintings raise funds for St Mary’s Cathedral in Perth, Western Australia. 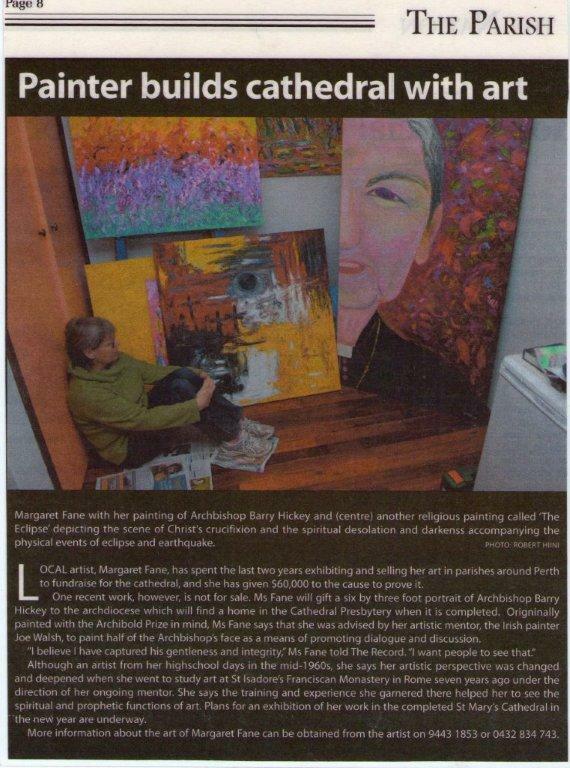 A collection of Margaret’s paintings are a part of Archbishop Hickey’s private collection. She has an annual exhibition at St Mary’s Cathedral in Perth on Easter Sunday. All proceeds from her paintings support St Mary’s Cathedral and Emeritus Archbishop Hickey’s homeless and orphanage projects. Images of her paintings are displayed on the 2015 Liturgical Calendar for the Catholic Archdiocese of Perth. All new work can be viewed and purchased at her studio 213 Yangebup Rd, Yangebup, by appointment: 0432834743. Her email address is marg.fane@gmail.com. Her “Memory” paintings are a series of paintings drawing on the memory of the time when she was growing up in Geraldton, Western Australia. She has recorded her recollections of the sufferings of the Aboriginal people at the time. Painting is a place for me. A place where I can go and feel completely at ease; a place where I come face to face with myself; the canvas being my other self. It is a dialogue, sometimes peaceful, sometimes frustrating, sometimes angry, sometimes exciting and sometimes one with myself. I am primarily an abstract artist, working mainly in Acrylics. I am also a representational artist, especially when I want to say something. for my own expression without relying on other artists. My work is often spontaneous, which is sometimes exciting, sometimes frustrating. It is a journey which I can map, watch, change and grow. I feel happy when I paint, sometimes never finishing. Sometimes it works, sometimes it doesn’t but the challenge is worth enduring, the focus is exciting and the dream reachable. For me, painting is a way of touching one’s soul and asking what is it all about?